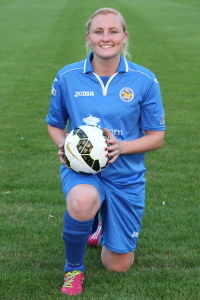 Leicester City Ladies added a second away win in a week with a 2-0 win at lowly Curzon Ashton. City dominated possession throughout and it told on 20 minutes as Hillier finished a fine solo goal. Second half was much of the same, however Leicester City Ladies needed Goalkeeper Cat to save a penalty to keep the lead before Whalley wrapped up the points late on. A frustrating afternoon for the away side but a solid win none the less. Leicester City Ladies now look forward to playing unbeaten Loughborough Foxes on Thursday night at the Nike Stadium. Leicester City Ladies Diamonds U15’s beat Bedworth Eagles 5-2 with a comfortable win. Both teams played with passion but Leicester City Ladies always had the edge and never really had to get out of 3rd gear. Leicester City Ladies opened the scoring through Olivia who drilled in a low shot into the corner. Bedworth equalised with a speculative shot that bounced over the keeper on the hard pitch. This was a bit harsh on Leicester City Ladies who had dominated the play up to then. This did not put off Leicester City Ladies though and with the midfield dominant they scored three more times before half time with an own goal from a Lucy corner, a good individual goal from D’shayney, a shot from Jenna who scored her 5th goal of the season already. Leicester City Ladies started off the 2nd half where they had left off and dominated play with some good passing. To their credit Bedworth never gave up and still made it a competitive game. Leicester City Ladies made it 5-1 with a good individual goal from Lauren which she finished off nicely. This enabled Leicester City Ladies to ring the changes and rest some players and try players in different positions. Bedworth kept battling and were rewarded with a 2nd goal just before the end. This was a very good win at a notoriously tough place to go and the team should be proud of their superb team performance. After a few difficult weeks for Leicester City Ladies with numerous players missing City had more of a team back and they battled out a hard fought win over Radcliffe Olympic. The game could not of started any better for Leicester City Ladies as Gemma Ball hit a fine free kick for what turned out to be the winner within three minutes. Two red cards later the game become stretched and a battle for both sides. City’s organisation this season for the majority has been superb and once again they stood strong. Hillier had a chance late on but fired an excellent strike just wide. Goalkeeper Cat on her return from injury was excellent punching away numerous long balls. City stood firm and credit to the girls for coming through a difficult period with such integrity. Leicester City Ladies Diamonds U15’s beat Bedworth Gems 2-0 in a very competitive game. Both teams played with passion and cancelled each other out in the 1st half but on the stroke of half time Leicester City Ladies took the lead with Jenna scoring, this was a bit harsh on Bedworth Gems to be fair. The second half again was again very competitive but Leicester City Ladies looked the livelier and looked the most likely to score. Leicester City Ladies got the 2nd in the end when a long range shot from Lucy flew into the net with a couple of minutes to go. This was a hard fought win against a well organised and competitive Bedworth Gems’ side. Leicester City Ladies Diamonds U15’s started the season in strong style with a convincing 8-1 away victory against Asfordby Amateurs. Leicester were on the front foot from the start and deserved to be ahead a lot sooner than they were. Molly opened the scoring then Lauren saw a thumping header come back off the bar but against the run of play Leicester were pegged back to 1-1 with Asfordby’s only shot on target all game. Jenna soon restored Leicester’s lead and they went into half time with a 2-1 lead. Half Time Score: Asfordby Amateurs 1 Leicester City Ladies Diamonds 2. The second half proved a much more convincing finishing display with six more goals coming from Molly x 2 to complete her hat-trick, a hat-trick from Jenna, a brave header by D’shayney and a long range shot from Tiarna. Such was Leicester’s dominance in the 2nd half the Leicester keeper didn’t actually touch the ball. Overall a very encouraging display but there is a lot more to come from the girls. Final Score Asfordby Amateurs 1 Leicester City Ladies Diamonds 8. Jocelyn, Shania, Olivia D, Beth, Tamzin, Olivia C, Tiarna x 1, Lauren, Jenna x 3, D’shayney x 1, Molly x 3, Chloe. Leicester City Woodgate Inclusive teams ‘ kicked off’ their season with a League Festival at AFC Barwell on Saturday 13th September. Our Inclusive section had 8 teams attending on the day, in the Adults Blue, Adults Red, Ladies, Junior and Youth Divisions. AFC Barwell volunteers worked very hard on the day to ensure all the players had a great time with the ethos being Respect and Fair Play whilst playing competitive football. Leicester City Woodgate Inclusive, with the support of AFC Andrews, will be hosting the next Inclusive League Festival on Saturday 11th October at Aylestone Recreation Ground, Knighton Lane East, Leicester, with games commencing at 2.00pm and finishing at approx 5.00pm. Leicester City Ladies U15’s team is looking to recruit players for the season ahead. The team moves to eleven a side football this season and after 2 successful seasons in the Leicestershire Girls League the team is looking to develop further and build on the squad. So, why not come along to training and find out what is involved, all players welcome, if you have played for a team before or not. Come along and see how you can get involved, bring a friend too. 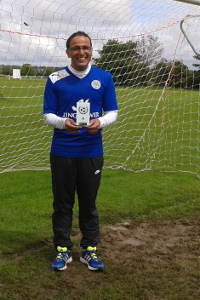 Play Football, Love Football with Leicester City Ladies F.C. 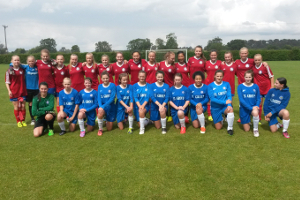 Leicester Ladies U15’s Diamonds played Ekholt from Norway at the superb Oakham School venue. 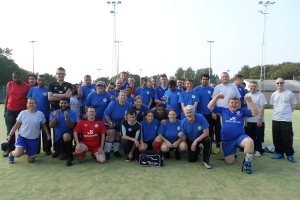 The game was played in a very good spirit with both sides very competitive. The 1st half ended stalemate with the defences playing very well to limit the scoring chances. In the 2nd half the game opened up a bit more and the Leicester City Ladies side proved the stronger with 3 goals coming. The 1st was a penalty by Molly after a Ekholt player had handled in the area. The 2nd also came from Molly as she fired in from close range after a good attacking move. 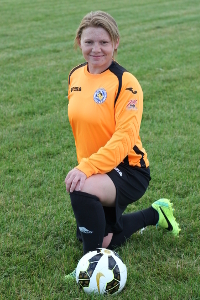 The third was an individual bit of class by Olivia who went on a mazy run and smashed a 25 yarder into the net. Overall it was a very good and enjoyable exercise and the girls look in good shape for the coming season. Two girls who deserve a mention and who played and defended very well were Olivia and D’shayney. 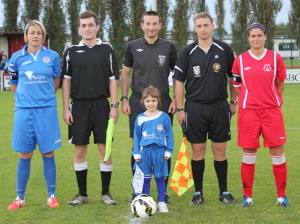 With a late switch of fixture to Aylestone Park Leicester City Ladies took on local rivals Loughborough Foxes in a competitive midweek league fixture. It was a depleted City squad after Sundays heroic extra time performance against Nottingham Forest and things got worse when goalkeeper Cat went down in the warm up and new signing Keely Upton only lasted seven minutes prior to injury. With game plans out the window a spirited City took the pitch and played out a well fought point. It was Foxes who took the lead with a long range shot, Preston equalised for City at the tightest of angles with a fine goal. Stand in goalkeeper Ball made some outstanding saves in the second half to keep City alive. Chances at both ends kept coming in the second half as a cup final atmosphere and end to end football was on show for the supporters. The game ended level however and after all the pre match trouble City take a hard fought point. After a very busy pre season with lots of changes Leicester City Ladies have still shown good resilience in the opening three fixtures . Sport has always been part of my life ever since I was about nine years old at Charnwood Junior School. I remember back in those good old days when we used to have activities such as egg and spoon race, three legged races, wheel barrows and the sack bag run. I started playing football at the age of ten. As anyone can image I was a very active and hyper child at that age. I regularly played Football with a group of friends in the school playground and in the park. Having a disability since the age of 3 months was difficult as anyone can imagine but life goes on and I never let it get in the way of my education or bother me as a child I remained positive and now it has allowed me to become the ambitious person I am today. In my school days the P.E. teachers did not know what to do with me as there was a lack of understanding and knowledge of dealing with a person with a disability in those years. However nowadays more people have an awareness as it is pretty common. Being an Inclusive Coach and football player and volunteer with Leicester City Woodgate Inclusive and Loughborough Lions. Coaching and volunteering and supporting various diverse groups. I enjoy Coaching, Playing and volunteering because it’s so rewarding and allows me to develop my life skills it also gives me the chance to meet new people, developing on my existing skills as a coach and respect the players. I enjoy interacting with so many different players who have different abilities. Being a sports Maker and my involvement with various sports has really had a great impact on others and it allows me to share my passion and experience for the sport and having the physical stamina as one requires to be very energetic and a sports motivator. Being a sports maker is all about having fun but also keeping safe and being involved with the sports no matter what the disability. My Dream as someone who is partially sighted would be to set up an Inclusive Futsal team within Leicestershire and Rutland. I believe it would be challenging but very rewarding looking into my future dream. It will be very beneficial for everyone as I have the passion and desire and being a very enthusiastic individual who always go the extra mile to support the future generation I believe it would benefit all players hugely as they would become more involved and for me to be their Role model and Mentor for them to be inspired. I would one day love the opportunity of become an Ambassador for the Inclusive Club.